To protect the history and cultures of past peoples? To share that knowledge and history with the public? To help people learn about the world around them? You probably didn’t answer to make looting of antiquities unprofitable or to catch criminals selling black market artifacts. But that’s just what the founding organizations of the Digital Library of the Middle East (DLME) envisioned in the wake of physical, cultural, and political conflicts in the Middle East and North Africa (MENA). Soon, their vision will be a reality. Founded in 2016 by the Council on Library and Information Resources (CLIR), the Digital Library Federation (DLF), and the Antiquities Coalition, the DLME intends to bring together existing Middle Eastern digital libraries from institutions and private collections around the world into a single searchable platform. The DLME will include all types of cultural heritage materials, extensively photographed, catalogued, and searchable in multiple languages. Through this free-to-use online platform, the DLME intends to serve the “partners and peoples across the Middle East and North Africa—to help reveal, share, honor, and protect collections of cultural materials and the living and historical cultures they represent.” This platform offers scholars and researchers ease of use and includes images, metadata, location, and provenance when available for all items listed. However, they want to be far more than a resource for students and scholars. Wars, both civil and foreign, have decimated the MENA region. Black market antiquities trading is a consistent source of income for terrorist organizations and warring states. The DLME will provide a large-scale database of known artifacts—documented and digitized—that customs officials, law enforcement agencies, and art dealers can use to determine if an item was stolen or looted from a conflict area. This not only helps to return objects to their rightful places, but also stops terrorist groups from funding their activities. 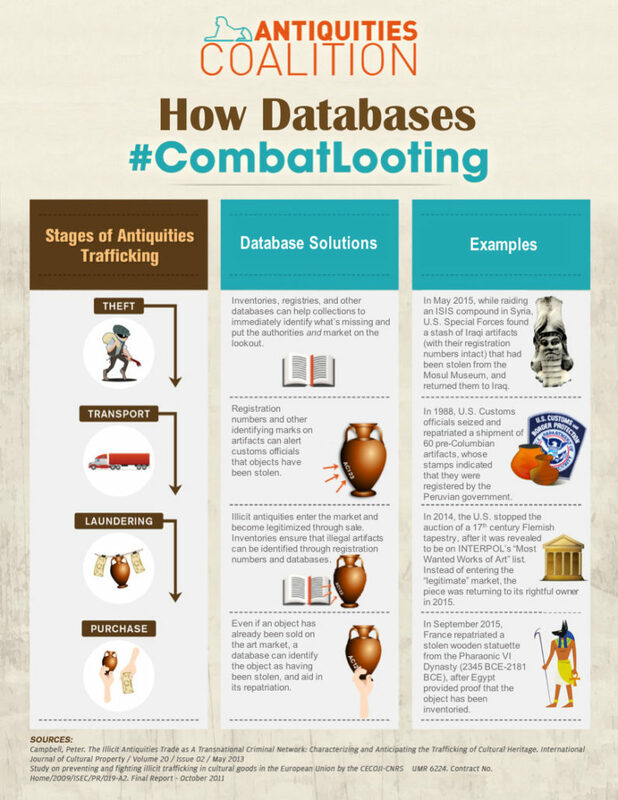 The Antiquities Coalition created this infographic to show just how digital databases help mitigate looting and the illegal antiquities trade. The DLME intends to bring countless databases together, making searching for the history or authenticity of an item far easier. Why Do We Need to Digitally Safeguard History? In the past 20 years alone, countless artifacts, manuscripts, and historical sites located in conflict zones have been lost. In 2003, while U.S. troops entered Iraq to remove Saddam Hussein from power, Baghdad’s Iraq National Museum was looted of nearly 15,000 items, including “ritual vessels, heads from sculptures, amulets, Assyrian ivories, and more than 5,000 cylinder seals.” The looting lasted 36 hours before U.S. troops finally secured the site. The loss could have been much worse. Many of the most valuable items were moved to a secret storage area known only to five people to safeguard them from looters, and a trove of gold, jewelry, and precious stones had been moved decades before to the Central Bank’s vaults for safekeeping. Recovering these items was further complicated by the lack of computerized documentation or photographic evidence. The Iraq National Museum had only begun the process of cataloguing its massive inventory into a single digital database when the looting occurred, and since it was a repository for artifacts from recent excavations, many items lacked even hand-written documentation. Thanks to an amnesty program, many of the items were returned voluntarily, and others were found in raids or reported by customs officials and art dealers. But despite all the progress, more than 8,000 items from the Middle East’s earliest historical sites are still missing. More recently, the war against the Islamic State (IS), or ISIS/ISIL, resulted in the mass destruction of two major UNESCO World Heritage sites, the cites of Nimrud and Hatra. After capturing the cities, IS forces proceeded to bulldoze and otherwise destroy as much of the cities as they could. This was done not merely to remove what they considered heretical idols, but to cover up their extensive looting of antiquities to be sold on the black market. During a 2015 raid on IS commander Abu Sayyaf in Syria, numerous Iraqi relics were found ready to be sold. Further evidence showed that IS had profited millions of dollars not only from the antiquities trade, but from taxing those pillaging excavation sites. Just how much was lost to looters and the wanton destruction that followed is still being discovered. If a database like the DLME existed during these times, officials and law enforcement agencies would have had access to accurate documentation of catalogued artifacts to catch looters trying to smuggle out the stolen pieces. Also, museums and governments would be able to confirm ownership on a contested artifact that managed to enter the legitimate art trade. Most importantly, future generations would have a full record of what was lost, even if it couldn’t be recovered. While the DLME does want to combat the illegal trade of antiquities from the Middle East, its core principal is one of access, research, and outreach to the community about the culture and history of the MENA region. It has already partnered with the Qatar National Library and the Stanford Libraries, as well as other museums and libraries around the world, for inclusion in the DLME’s searchable platform. The DLME’s prototype is already in use by scholars, allowing for discoveries that would have remained unknown if not for the federation of so many various source institutions. Through the DLME prototype, Jacco Dieleman, an Egyptologist based in Washington, D.C., located two papyri in the University of Pennsylvania’s Rare Book & Manuscript Library, one of which had never been published. Thanks to the DLME, this piece of history could now be included in Egyptology research. As more databases are added to the DLME, the qualitative value of its results will substantially improve the cultural conversations and research about the MENA region. You may have noticed above that the DLME is currently a prototype, but that doesn’t mean you can’t use it. The DLME is able to reference more than 130,000 records from various institutions around the world. These can be searched in a variety of ways, such as by language, location, country of origin, era, type of item, creator, and more. And it won’t be a prototype forever. 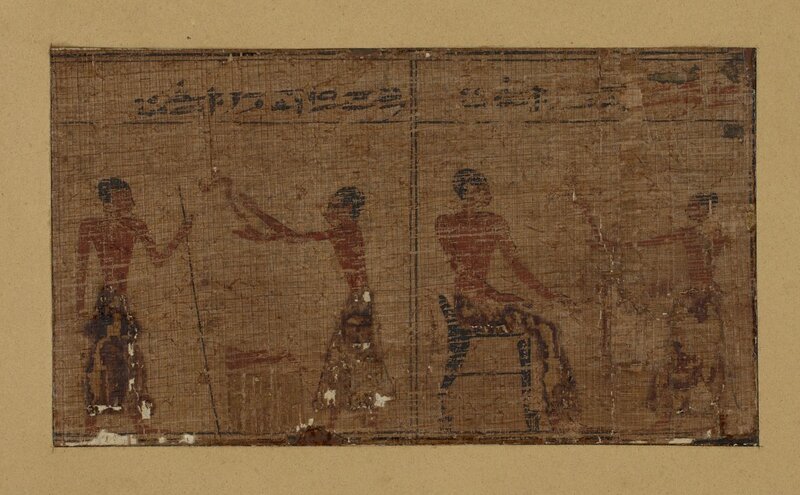 In April, the Andrew W. Mellon Foundation awarded the CLIR $1.12 million to complete the DLME. When finished, the DLME will be accessible online and through any mobile device. The final version is expected to launch in 2020, though the CLIR and DLF intend it to grow and adapt with changing technologies. Ultimately, that is the goal of most digital collections: to share knowledge in order to protect and preserve a part of our past or present civilizations. Through digitization and thorough documentation, we are better able now than ever before to ensure the survival of culturally or historically significant materials, even if the artifacts themselves become lost or destroyed. If you’d like to start a digital collection of your own, or need a search platform to make an existing digital collection more accessible, contact Anderson Archival by phone at 314.259.1900 or by email at info@andersonarchival.com.